It’s been almost a month since my mishap with electric cutter , I have been posting on and off , been working on some art in between when I can . But for the most part, learning the importance of being able to use both hands and side by side learning on how to get on with using one hand ( well mostly for everything) . Though for the 1st few days after the accident , I had my mother taking care of things, I started to feel depended . It was a strange feeling something I never really experienced before. A friend of mine joked that I will now be taken care of like a baby,and I should just kick back and enjoy the ride as long as it goes, but I couldn’t. Just a few days in to the incident I started to feel uneasy , no matter what my mum did for me I was uncomfortable , not that my mum wasn’t doing a good job, in fact she was doing her best ever, But for me I wanted to do things on my own, lying in the bedroom at my parent’s home, I thought about all that I could accomplish with both my hands and made a mental list of things I can do with one hand. I’m right-handed but for most things I use both my hands. 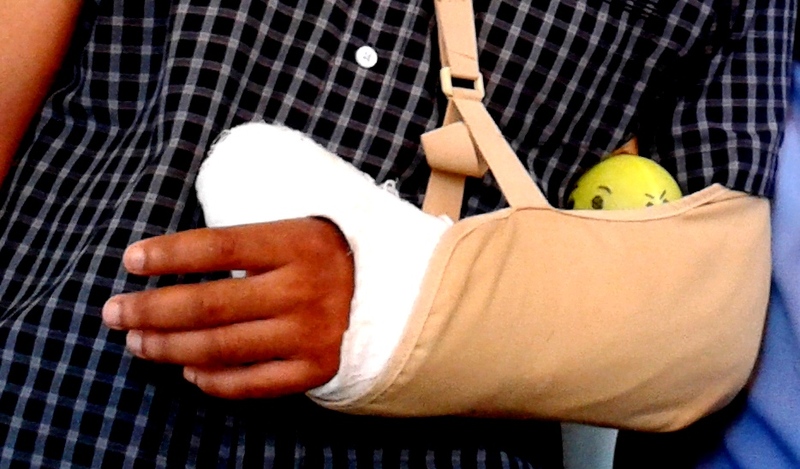 With my left arm in a cast and sling, my right had to do more. Then I realized, I could use other parts of me like my Knee, Foot,Elbows and most importantly my mouth ! !.Folding the bed sheets, putting out the laundry,opening water bottles, locking and unlocking doors. As I carry a back pack to work, opening and closing the zipper was the 1st to get used to – a combination of mouth and right hand , at times my knees , elbows and feet come to aid .From unpacking my medication to washing up after myself , taking a bath ( my rain coat came in handy 🙂 ) one big time accomplishment was learning to tie my own shoe lace with my right hand and feet !!!.. I picked these up in about 2 weeks time . Soon it became a challenge..just about anything and everything I could do , I’d do !!! After a while I would respectfully turn down offers from my colleagues to help , not that I was being stubborn on egoistic about it . I was on this drive to push my self more, May be my past experience and lessons from my bad marriage kicked in , days when I thought I was alone,living with “whoa me” feeling for too long in the past. All that and many lessons I had in my earlier years came in to help. This was also a good time for me to reflect on living by my self , I missed a certain person from my life all through this , though I still wait for that person , I need to learn to take care of my self till that day happens. Realized that there are some people out there, actually don’t care or in fact glad about the incident – One man’s wrong is another man’s right ,that’s’ how the world is. Any way I wanted to see what all I could do, given this opportunity ! …yes opportunity !! It wasn’t a mishap or accident any more. It was an opportunity to do things I thought I could never get done . An opportunity to learn to rely on my own both mentally and physically. An opportunity to be me in the best me I can be, in my silent world . 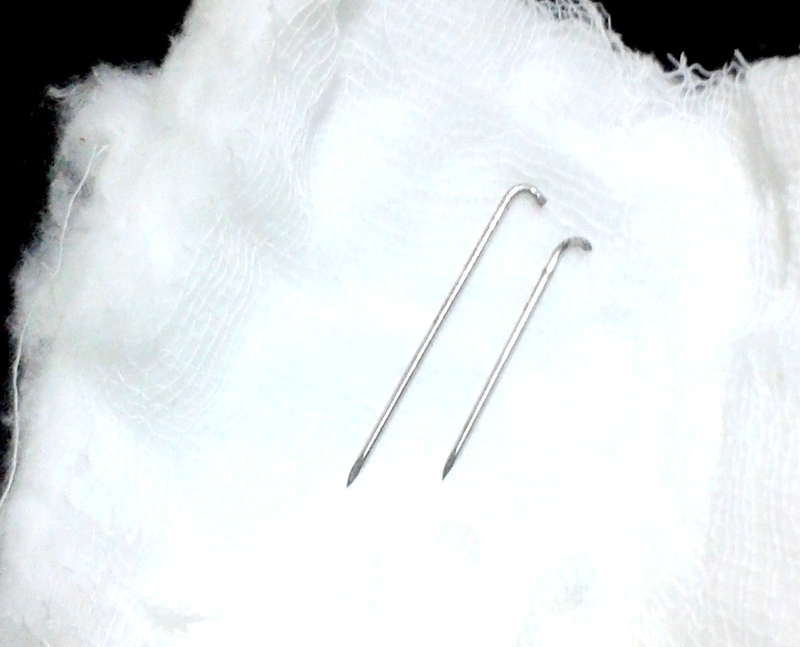 Yesterday, the cast came off , and so did the k-wires ( frankly I don’t know why they call it a wire , to me it looked like 2 inch headless steel nails !!!) . 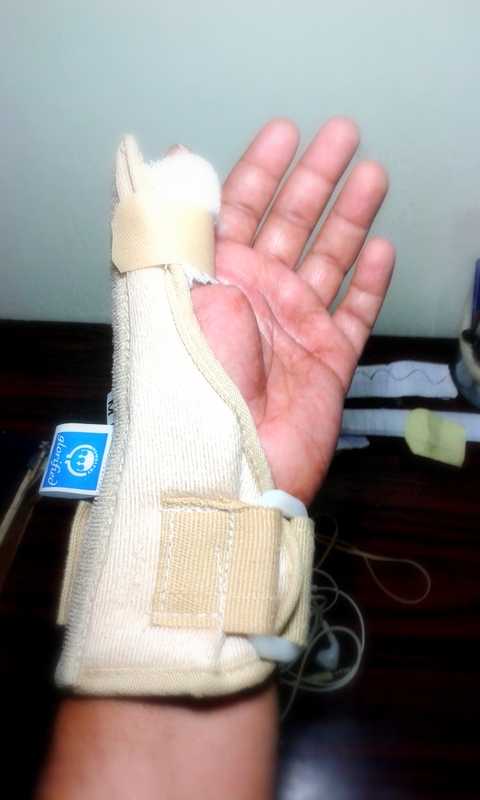 Now another 2 more weeks in a thumb splinter with more challenges and opportunities awaiting…….. Being positive is certainly helping you to get through until your recovery 🙂 Best wishes and stay strong!